Gov. Bruce Rauner delivers his annual budget message to the General Assembly on Wednesday, Feb. 14, 2018. Members of the General Assembly, distinguished guests, members of the media. To the members of our National Guard, our service men and women, and our veterans – thank you on behalf of a most grateful state. To the citizens, the taxpayers, of Illinois, it is an honor to serve you. Happy Valentine’s Day to all. Let’s begin today with a moment of silence to honor Chicago Police Cmdr. Paul Bauer, who was killed in the line of duty yesterday protecting the people of Chicago and the state of Illinois. Let us also remember the young victims and survivors of the NIU campus shootings 10 years ago today. Please join with me and remember them in our prayers. Two weeks ago, we met in this chamber to discuss the state of our state. I said then and I repeat today, we are in a state of readiness, poised to leverage Illinois’ many natural advantages — our people, our location, our transportation network, our diverse resources — to become the economic powerhouse of the Midwest. To fulfill that mission is to serve the best interests of everyone in our state. If our economy rises, everyone will rise with it. Our businesses will grow and create more jobs. Our family incomes will rise. Our young will have more opportunities to learn and earn. Our service to citizens will expand. Our taxes will go down. Our quality of life will go up. We can make all this happen. But we must abandon Illinois’ fiscal status quo, and take steps to make tax-spenders more accountable to taxpayers. We must enact structural reforms that allow us to be as competitive as we need to be, so we can be as compassionate as we want to be. Make no mistake, we are in a competition ... and the states around us are winning at our expense. They have out-legislated us, and now, they outgrow us. Manufacturing jobs, many of which go to union workers, are up 110,000 in Indiana over the last eight years, while manufacturing jobs in Illinois are up only 8,000 in that same time period. In just the last year alone, private sector union jobs are up 36,000 in Wisconsin, and up 47,000 in Michigan, but down 9,000 in Illinois. And many factory workers in other states are now out-earning our brothers and sisters here in Illinois. We can’t let this happen to our hard-working families. It is time to get back in the race. Low growth and expensive bureaucracy are devastating. They reduce Illinoisans’ net take home pay. They rob us of our ability to invest in education, human services, public safety and infrastructure. They constrain our economic growth, our tax base and our wage rates. Our FY19 budget sets out to make the structural reforms that will get us moving in the right direction. It reduces government expense but not customer service. It shifts responsibility for the cost of services to the people who buy those services. And it recognizes that we will never have balanced budgets if government grows faster than our economy. These are the priorities we’ve set for the next fiscal year and beyond. They put a stop to the unsustainable growth in our pension and health care costs, halt and reverse the advance in taxes, and restore emphasis on investments in education, human services, public safety and infrastructure. Our reforms must begin with pensions and employee group health expenses. They now consume 25 cents of every dollar the state spends, and they grow faster than you can raise taxes, and we can grow the economy. In FY18, we spent more of our budget in these two categories than we spent on K-12 education. The simple truth is this: We have to change the way we manage pension costs and group health expenses. If we don’t, our finances will continue to deteriorate, our economy will remain sluggish and our tax burdens will stay high and keep rising. Our FY19 budget addresses the problem head on, and creates a surplus that we can use to pay down some of our debt. The key reforms have to do with accountability. We need to move pension costs to the people who do the buying, and make them responsible for the paying, too. If we do this realignment, we can eliminate the $2 billion deficit in the budget you passed last summer, avoid new taxes, fund top priorities, and start the long process of paying down our bill backlog with cash instead of credit. But we should also do something that will really make the economy grow faster, that will really make the Amazons and Apples of the world take notice. 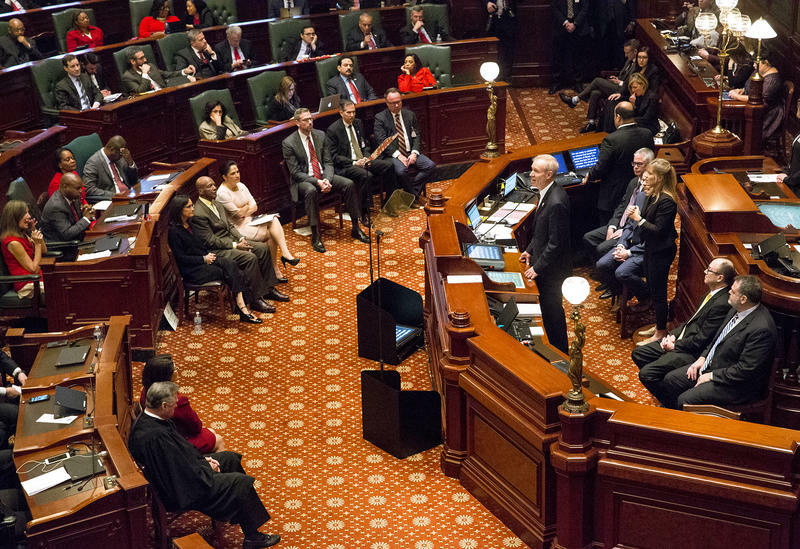 We should take the big step, and do what taxpayers have urged us to do for a decade: Enact comprehensive pension reform, and give Illinois taxpayers a nearly $1 billion tax cut. They deserve it and they can use it. This is the kind of financial accountability that Illinois taxpayers expect. It is time we lived up to their expectations. When my wife and I moved into the Governor’s Mansion in 2015, we noticed that every light was turned on. I don’t know about you, but I was raised that if you left a room and didn’t shut out the lights, you’d be in trouble. Of course, this led us to ask what the utility bill was for the mansion. It took two weeks to track down who actually got the bill in the government bureaucracy, and to discover that it cost the state almost $100,000 a year. Outrageous. We immediately put in good energy management practices to cut the bill substantially. My point is this: If you separate the payment from accountability ... there is no accountability. People don’t question the expense, they just pay it. This story illustrates what is wrong with pension and group health expenses. In our system, the state gets pension bills and just pays the tab. Our budget proposal shifts costs closer to home, so people can question expenses and deal with them more directly. Now, they have no incentive to manage costs because the state picks them up no matter what they are. When they are responsible for paying the bill, there will be plenty of incentive to lower costs. We will ask school districts to begin sharing the cost of their own pensions. We’ll phase in the shift over four years— in 25 percent increments per year — and give schools and local governments the tools they need to more than offset the costs. The tools include increased education funding, the power to dissolve or consolidate units of local government, and more flexibility in contracting, bidding and sharing services. As a matter of fairness, the Chicago Public Schools will get the same offsets as all other school districts in the state, including its portion of the increase under the new funding formula. But, recognizing that CPS got to keep the benefits of its special block grant in the base of our new funding formula, we propose that CPS absorb its normal pension costs as it did before last year. We will ask universities to pay their pension costs — also phased in over four years — and to pick up their health care costs, with offset tools that include an additional $205 million in appropriations in FY19. These shifts will save the state $696 million this year. We recommend right-sizing employee health insurance plans so that government compensation is more in line with what the taxpayers have who are paying for it. Today, we pay almost 90 percent of the premiums for government employee health insurance policies that are way more expensive than plans in the private sector. State government needs to do what every employer in Illinois has done over the last 10 years: Get its health care costs under control. Taxpayers shouldn’t have to pay for government health insurance policies that are richer than ones they can afford for themselves. If we legislate group health insurance changes the way the Massachusetts legislature has done, we can save Illinois $470 million in general revenue funds this year, and $560 million in all funds. We also need to reduce workers’ compensation insurance rates. They are the highest in the Midwest, and they are pushing out our manufacturers. Business leaves the state to escape them or won’t come to avoid them. It’s one of the reasons we are losing business and population to states on our border. If we reduce our rate to the national average, businesses as well as local governments will benefit from lower costs, and we will create tens of thousands of new jobs over time. Not only would we have faster economic growth that would help keep our budgets balanced, but taxpayers would directly save tens of millions of dollars in lower government costs. And one final point. It is time ... no, it is past time ... to actually sell the Thompson Center in Chicago, without any extra fees or charges tacked on. These moves — many of which have been supported by the General Assembly in prior years — alleviate a $1.3 billion annual burden on taxpayers, and release money we can then spend on education, public safety, human services and infrastructure in FY19. I know this idea of “reforms to stimulate growth” topples Illinois’ traditional budget approach — the one where you decide what to buy, then buy it even if it means spending beyond your means. The FY18 budget, enacted last July over my veto, is running a huge deficit that proves the point. That unbalanced budget was built on the back of a $4.5 billion income tax increase, $6 billion in long-term debt, and a still increasing backlog of unpaid bills expected to rise to $7.7 billion by the end of this fiscal year. Our approach is decidedly different. We see the budget as an opportunity to set priorities without spending beyond our means. It is a framework designed to spark a constructive dialogue on the steps we need to take to resolve the state’s financial issues. Our mission is straightforward: Enact reforms, be accountable, deliver on our promises. Our goals align with the needs of our citizens: Provide the best education on earth for our children; ensure justice and equality for the deserving but disadvantaged; share compassion for our veterans, the elderly, and our most vulnerable; provide security for our communities; and maintain our streets and bridges. Our guiding principle is this: Spend only the money we have, and don’t increase the tax burden on the people of Illinois. The bottom line is this: We need reforms, and we need to shift accountability so that we can put more resources into education, human services, public safety and infrastructure. That’s where our FY19 budget is focused. That’s the outcome we want to produce. Our administration is an emphatic advocate for education investment. By enacting structural reforms, we will be able to spend a record $8.3 billion on preK-12 education. That includes $350 million of new money distributed through our more equitable funding formula. PreK-12 funding has risen a cumulative $3.7 billion since I took office. We also will spend $454 million for early childhood education, up 55 percent since I became governor. This investment is critical to our future. The work world around us evolves as technology advances. The skills needed to succeed in our economy are dramatically different than they were just a decade ago. Our own manufacturing sector is a perfect example. Where once there were get-your-hands-dirty assembly line jobs, workers must now be equipped to use computer-directed equipment, manage software to track inventory, and build intricate high-tech products. Our obligation to our next generation is to prepare them ... by the millions ... to fully participate in the workforce of the future. The bipartisan effort we produced last year to bring equity to our school funding formula was a key step. Invest in Kids expanded education choices for tens of thousands of students. Our Cabinet on Children and Youth helps children reach their 25th birthdays as engaged, educated, self-sufficient citizens with marketable skills for a meaningful career. We must make higher education a critical priority, too. Illinois public university enrollment declined by 50,000 students from 1991 to 2014 as tuition and fees rose. Our budget conflicts didn’t help that trend. This year we bring an end to budget reductions for our university and community college systems. We add $100 million in capital funds to meet deferred maintenance needs. We maintain MAP grants at FY18 levels, and lay the foundation for increased MAP funding in the future. We also recommend a capital grant to the U of I for its Illinois Innovation Network and Discovery Partners Institute, to leverage billions of dollars in private donations to the U of I and spur enterprise formation that will make us the envy of the technology centers on both coasts. This capital investment could be the biggest spark ever to ignite our economic growth engine. The Illinois Board of Higher Education is developing a single, statewide strategic plan to make academic offerings more attractive to students, and drive more efficiency in their service offerings. We look forward to the results of their work. Compassion is in the DNA of Illinois. Our budget mirrors this fundamental attribute. With reforms to our pension and group health programs, we can provide resources for veterans, families, children, the elderly, the sick and the ailing. This week, despite aggressive precautions and new water treatment systems, Legionella bacteria infected two patients at our Quincy Veterans Home. Early detection led to successful treatment, but the infections sent a clear message. We need to move quickly — and we need to have money — to make structural changes to ensure protection for our veterans. Our water management task force met yesterday to begin a review of an engineering report on the home’s water systems. We’ve allocated $50 million in capital improvements to be prepared to address their recommendations for Legionella control. To further help our veterans, we need to move forward and complete the long-delayed construction of a new 200-bed veterans home in Chicago. We expect to spend $1 billion on child care assistance for families with incomes up to 185 percent of the federal poverty level. We will also increase funds for early intervention programs and developmental disabilities services. Our budget addresses a necessary commitment to our elder population. We maintain funding levels for programs that serve 62,000 Community Care Program clients, and provide adult protection and in-home services. We’re shifting clients to Managed Care Organizations administered by Healthcare and Family Services ... with no change in services, but big savings in cost. When it comes to children and youth, we have improved a fragmented system that wasted money, and too often failed to help young people become successful adults. In the Department of Children and Family Services, the FY19 budget adds staff for Intact Family Services, to help deal with cases that present the highest risks for young children. DCFS has redesigned the adoption subsidy process. There was a 16 percent increase in adoptions and a 31 percent increase in guardianships in fiscal year 2017. That means nearly 2,200 children left state care and found homes last year. We’ve had an unacceptably high number of youth confined in psychiatric hospitals, juvenile detention, or emergency shelters. We’re working to lower those populations. The principles of reform and accountability guide our approach to Medicaid as well. We’ve made significant structural changes in this program, most notably a more thoughtful shift to managed care, a move that will save taxpayers hundreds of millions in the years ahead, and help us hold providers accountable for the quality of the care they deliver. Medicaid enrollment has slowed in recent years, but it still serves nearly one-quarter of our population — about 3.1 million people. That number will stay essentially flat in FY19, and we have budgeted $14.2 billion to provide care for eligible patients. This takes into account $450 million that our task force has saved, so far, through fraud detection and prevention. We have also developed a comprehensive strategy to address behavioral health. It transforms payment and delivery models, increases managed care, enhances workforce capacity and establishes greater accountability. We are working closely with the federal government to get approval of a Section 1115 waiver application that will let us more efficiently and more effectively treat our 800,000 Medicaid enrollees who suffer with mental and behavioral health problems. Reforming our criminal justice system is a priority for our administration. Structural reforms mean we can devote more resources to the people and programs that protect us from those who would do us harm. Two more Illinois State Police cadet classes will graduate this year, and the budget anticipates another class in FY19. That means up to 300 more troopers on the force. Our budget addresses the opioid epidemic, fully funding programs that enhance enforcement and addiction recovery. Some 28,000 offenders are released into our communities each year. Nearly half return to prison within three years. The rates of recidivism are too high. Jobs are a key antidote. So, we have allotted $26.4 million for the operation of life skills re-entry centers in Kewanee and Murphysboro, to help people get back to work instead of going back to prison. We will spend $36.4 million for mental health facilities at Joliet and Elgin, which will supplement the three residential treatment units at Pontiac, Logan and Dixon. The FY19 budget provides $10.2 million for Adult Redeploy Illinois to promote community-based supervision. There is also $110 million in federal funds allocated to reduce crime, and help victims get the services they need. For the fourth year in a row, we will deliver more capital for infrastructure projects. Our budget provides $2.2 billion in pay-as-you-go funds for the Department of Transportation’s annual road program. Additionally, we will provide $511 million in new capital funds for other IDOT needs in FY19. That brings total new transportation infrastructure spending by our administration since 2016 to nearly $10 billion. We should finalize private investment in infrastructure improvements, like the I-55 managed-lane project, where private investors are willing to invest hundreds of millions to build and manage a new and improved highway. Our administration has been actively engaged in conversations over the last year with the White House and the U.S. Department of Transportation about an infrastructure program. As the plan announced this week works its way through Congress, we will work closely with our Illinois Congressional delegation to maximize the return on Illinois’ investments in its infrastructure. All along we have been clear about the necessity to meet critical public needs with the resources available to us. The surest way to do that is to enact reforms that bend the cost curve of government, and stimulate our economy to bring new jobs to Illinois. The key to balanced budgets is to have our economy grow faster than our government spending. I vetoed the FY18 budget because it did not provide the reforms needed to end our deficits, and achieve balanced budgets and sustainable economic growth. Unfortunately, I was right. We were forced to spend more than $1 billion to meet obligations set into law, but under-appropriated. Now, you need to pass a supplemental spending bill to cover these costs. This sort of budget shortfall underscores the urgency of our circumstances. We simply have to slow the growth of our spending, and grow our economy faster. Higher tax rates can never fix this structural necessity. Our FY19 proposal asks you to engage with us to make sensible, long-overdue reforms, and to shift control to the people who pay the bills. Move pension and health care costs where they belong. Give local governments the tools to cut costs. Reduce workers’ comp rates. Sell the Thompson Center. These savings will produce a surplus to put against our backlog. Better yet, they will energize our economy. And if you work with me to take the next logical step and pass true pension reform, we will be able to enact a nearly $1 billion tax cut, and start rolling back the income tax rate. Let’s face it. For middle class wage earners and young mobile workers, the pension crisis is not about the politics that are played in Springfield. It’s about how much money we are taking out of their pockets. The people of Illinois are taxed out. A billion-dollar income tax cut should be our No. 1 objective by the end of this session. Together, let’s learn from our past, talk honestly about the future, move ahead, and make Illinoisans the big winners. Our budget proposal is a framework that balances the interests of those who spend our taxes with those who pay the taxes. It balances the need for reform with the time we need to implement it, and the tools we need to reduce the associated costs. We are ready to collaborate on reforms that benefit the taxpayers of Illinois. Our ideas are here for you to consider. We share a sense of urgency with you and every citizen of our state. And we welcome a call to the table for serious conversations about how to proceed. This is the essence of Illinois’ work ethic, the essence of our value system. Let’s do this budget. Let’s fix our systems. Let’s give fiscal integrity to our people. Let’s roll back the tax hike, and give power and prosperity back to the people of Illinois. Thank you. God bless you all. God bless our veterans. God bless the people of Illinois. And God bless the United States of America.